The fifth theme in this year’s 52 Ancestors is “Plowing Through.” When presented with this theme I automatically assumed that I would focus on a ancestor who was a farmer as there are many of them in my family line. Instead, I decided to do more research on a relative who I had little information about before researching. I was always curious about my grand aunt’s husband (Ellis Blake Galbraith) and his family as I had little more than a name and a tidbit that one of his relatives fought in the 1885 North-West Rebellion. In my research during 2014 I was able to find more information on my aunt’s husband, his siblings, parents, and even a bit on his grandparents. This week I will be looking at the brother-in-law of my grand aunt named Nelson Thomas Carlyle Galbraith (1914-1994). Nelson was born to parents Thomas Duncan Galbraith (1878-1957) and Mary Ellis (1882-1963) on Mar 29, 1914, in Dufferin, Manitoba and was the second eldest son of seven children. The eldest was Blake who married my grand aunt Ruth Elizabeth White. As his father, Thomas Duncan, was a solider during the first world war he moved to Camp Hughes while the rest of the family resided in Winnipeg on the 1916 Census. The family is then found in the 1921 Census in the RM of Dufferin but without their father Thomas Duncan who I assume is somewhere else working for the Canadian Military. On Sep 8, 1939, two days before Canada officially entered the Second World War, Nelson signed up for military service and became part of the Winnipeg Grenadiers, B Company, 8th Platoon. It is likely that he served in Jamaica and Bermuda before the 1st Battalion landed in Hong Kong on Nov 16, 1941. Sadly, the Granediers would experience some of the first fighting in the Pacific when they lost in the Defence of Hong Kong to the Japanese on December 25, 1941. The photograph below is from the December 1939 photo album of The Winnipeg Grenadiers (M.G.) – Canadian Active Service Force. Nelson can be seen in the top 3rd row, second from the end on the right hand side. 1st Row – Cpl. Stancove, A., Mabley, G.K., L-Cpl. Sexsmith, C.L., Wood, E., Wermie, M.R., Sgt. Foster, R.M., Lane, G.O., Maddess, C.R., Moore, W.S., Vibert, J.P., Cpl. Stanley, C.
2nd Row – McTaggart, H.P., Foster, S.P., Clubine, C., Nobiss, R., Lawrie, K.R., Donnelly, H.G., Bloomfield, B., Kincaid, C., Mallows, H., L-Cpl. Deacoux, M.J., Bilyk, M.
3rd Row – Cyr, L., Moore, J., Davidson, D.F.A., Pascal, J., Davies, J.C., Smith, R., Edgley, C., Knight, J.G., Galbraith, N.C., Olason, M.J.
Nelson’s name is listed in a Winnipeg Free Press article on Jan 1, 1942 in the pictorial articles These Men Made Valiant Stand in Hong Kong’s Defence. His name is mentioned a number of times more in several other articles of the Free Press during the course of his imprisonment. Ottawa, Oct. 19. (CP) – Another group go names of men now officially reported prisoners of war as a result of the battle of Hong Kong was released today by the department of national defence. The list included 97 names which, together with 120 released last night and the number announced last week, brings the total number officially reported to be in the hands of the Japanese to 496. The original Hong Kong fore of two battalions and a bridge headquarters numbered 1985 men.All the names on today’s list were of men of the Manitoba regiment, of which the Winnipeg Grenadiers which fought at Hong Kong forms a part.So far no names have been announced of prisoners of war from the Royal Rifles of Canada, Quebec, the other battalion which fought at Hong Kong. As the names are received by cable from Japanese authorities at Tokyo, it is expected the Royal Rifles its will start coming after the Winnipeg Grenadiers list is completed. Last night’s two lists included one officer and 119 other ranks. All but one were names of members of the Manitoba regiment, presumably the Winnipeg Grenadiers. It is expected that a complete list will be available from Japanese authorities shortly, through the International Red Cross. 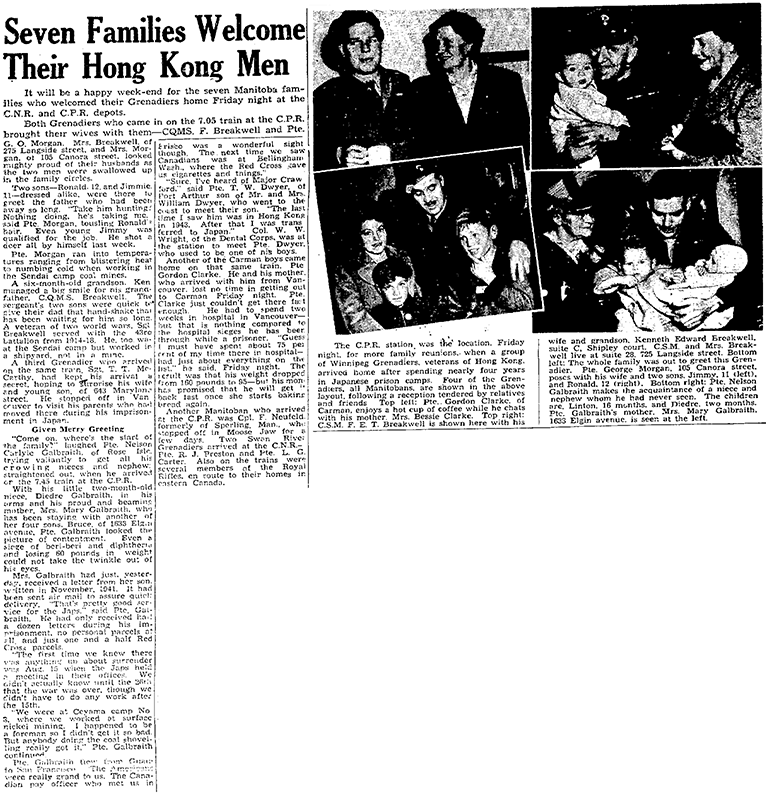 Previous some 500 members of the force which fought at Hong Kong were unofficially reported prisoners on the basis of word from people who escaped and letters from prisoners. The only officer in last night’s list was the sole man named who was not a member of the Manitoba regiment. He was Capt. 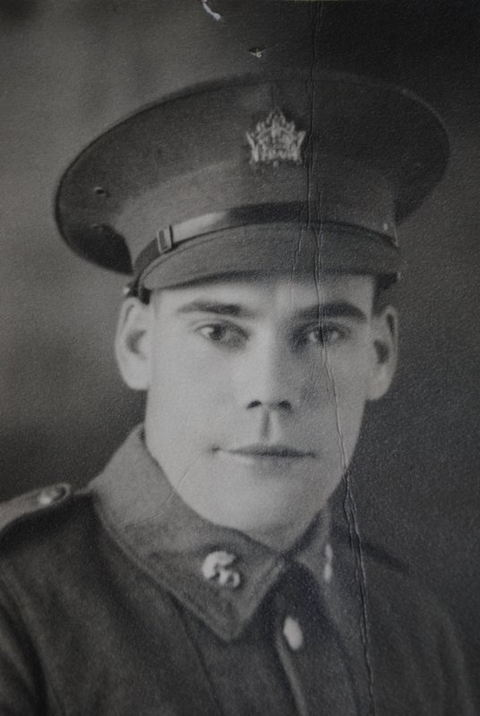 John A.G. Reid, of Toronto, of the oral Canadian Army Medical corps. 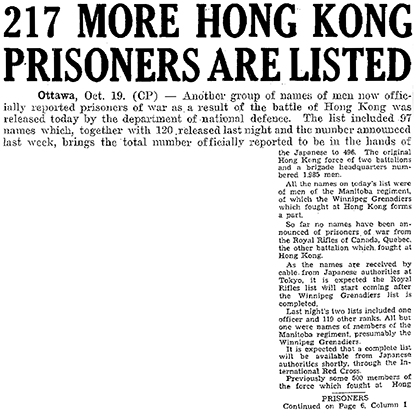 The Canadian force at Hong Kong numbered 1985 men and the Japanese reported they took 1689 prisoners. It is officially assumed here from this that 296 Canadians were killed or missing. Lt.-Col. J.?.R. Sutcliffe, officer commanding the Winnipeg Grenadiers, and several others are known to ave died while prisoners and there may have been other deaths. The Hong Kong garrison consisted of Canadian, British and Indian troops. The battle for the British colony lasted from Dec 7 last year under its surrender Christmas Day. Today’s list was the 178th Canadian (active) army’s overseas casualty list of the war, and last night’s the 176th and 177th. Following is the 178th casualty list, with official numbs and next of kin. Galbraith, Nelson Carlyle, Pte., H6186. Mrs. Mary Galbraith (mother), Box 12, Roseisle, Man. The camp where Nelson would spend the next few years of his life was called Oeyama and it was located 12 Kilometers from Miyazu Harbor. This camp was established on Aug 20, 1943, with the first POWs arriving on Sep 2, 1943. A total of 700 POWs would call this camp home. Prisoners destined for Oeyama traveled on the Manryu Maru for 17 days, making stopovers in Taihoku (Taipei), Formosa (Taiwan); then 2 day stopover at northern point for stool tests, before being transported to Oeyama. Prisoners at Oeyama were forced to work mining nickel and work at the Nippon Yakin Nickel Refinery. In general a cheerful tone prevailed throughout letters received by families of the Winnipeg Grenadiers and brought into the Free Press. 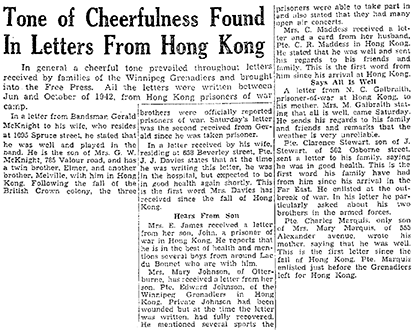 All the letters wore written between June and October of 1942, from Hong Kong prisoners of war camp. A letter from N.C. Galbraith, prisoner-of-war at Hong kong, to his mother. Mrs. M. Galbraith stating that all is well, came Saturday. He sands his regards to his family and friends and remarks that the weather is very unreliable. Oeyama Camp was closed on Sep 2, 1945. Nelson was able to return to Canada shortly after his rescue, and he was able to return to Winnipeg in October 1945. It will be a happy week-end for the seven Manitoba families who welcomed their Grenadiers home Friday night at the C.N.R. and C.P.R. depots. “Come on where’s the star of the family?” laughed Pte. Nelson Carlyle Galbraith, of Rise Isle, trying valiantly to get all his crowing nieces and nephew straightened out, when he arrived on the 7.45 train at the C.P.R. With his little two-month-old niece, Diedre Galbraith, in his arms and his proud and beaming mother, Mrs. Mary Galbraith, who has been staying with another of her four sons, Bruce, of 2633 Elgin Avenue, Pte. Galbraith looked the picture of contentment. Even a siege of beri-beri and diphtheria and losing 60 pounds in weight could not take the twinkle out of his eyes. Mrs. Galbraith had just, yesterday, received a letter from her son written in November, 1941. It had been sent air mail to assure quick delivery. “That’s pretty good service for the Japs.” said Pte. Galbraith. He had only received half a dozen letters during his imprisonment, no personal parcels at all, and just one and a half Red Cross parcels. “We were at Oeyama camp No. 3, where we worked at surface nickel mining. I happened to be a foreman so I didn’t get it so bad. But anybody doing the coal shovelling really got it,” Pte. Galbraith continued. On the Hong Kong Veterans Commemorative Association website Nelson’s name is found on a page for ‘awards’ was mentioned in a dispatch. Nelson married Helen Peal Couser on Aug 16, 1946 in Winnipeg, Manitoba and the couple would have two children Graham and Shelagh. Home Street United Church was the scene of a wedding August 16 at 8 p.m., when Helen Pearl, youngest daughter of Mrs. E. Couser was united in marriage to Nelson Carlyle Galbraith, son of Mrs. E. Galbraith. Rev. C.E. Whitmore officiated. Miss Helen Young played the wedding music and Miss H. Wills sang.Given in marriage by her brother. Thomas Couser, the bride wore ivory satin, the fitted bodice fash- and lily point sleeves. The full skirt fell from the dropped waistline, into a slight train. A sweetheart head-dress held her fingertip veil. She carried red roses.Miss Margaret Davis was bridesmaid and Bruce Galbraith was best man. Ushers were Blake Galbraith and Jack Davis.A receptions as held at Peggy’s pantry. Following a short honeymoon, Mr. and Mrs. Galbraith will reside in Winnipeg. 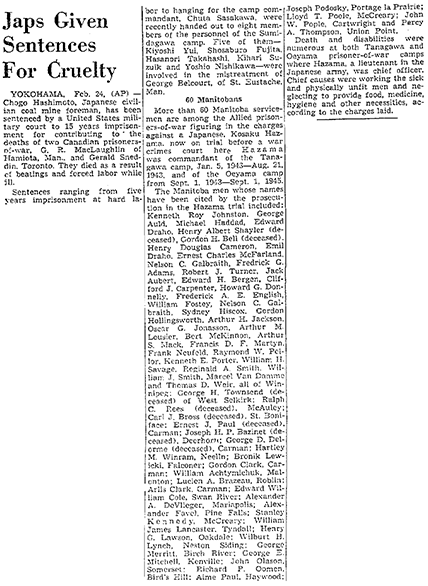 YOKOHAMA, Feb. 24, (AP) – Chogo Hashimoto, Japanese civilian coal mine foreman, has been sentenced by a United States military court to 15 years imprisonment for contributing to the deaths of to Canadian prisoners-of-war, G.R. MacLaughlin of Hamiota, Man., and Gerald Sneddin, Toronto. They died as a result of beatings and forced labor while ill.Sentences ranging from five years imprisonment at hard labor to hanging for the camp commandant, Chuta Sasakawa, were recently handed out to eight members of the personnel of the Sumidagawa camp. Five of them – Kiyoshi Yui, Shosaburo Fujita, Kasanori Takahashi, Kihari Suzuik and Yoshi Nishikawa – were involved in the mistreatment of George Belcourt, of St. Eustache, Man. More than 60 Manitoba servicemen are among the Allied prisoners-of-war figuring in the charges against a Japanese, Kosaku Hazama, now on trial before a war comes court here Hazama was commandant of the Tanagawa camp, Jan. 5, 1943 – Aug. 21, 1942, and of the Oeyama camp from Sept. 1, 1943 – Sept. 1, 1945. The Manitoba men whose names have been cited by the prosecution in the Hazama trial included: Kenneth Roy Johnston, George Auld, Michael Haddad, Edward Draho, Henry Albert Shayler (deceased), Gordon H. Bell (deceased), Henry Douglas Cameron, Emil Drahom, Ernest Charles McFarland, Nelson C. Galbraith, Fredrick G. Adams, Robert J. Turner, Jack Aubert, Edward H. Bergen, Clifford J. Carpenter, Howard G. Donnelly, Frederick A.E. 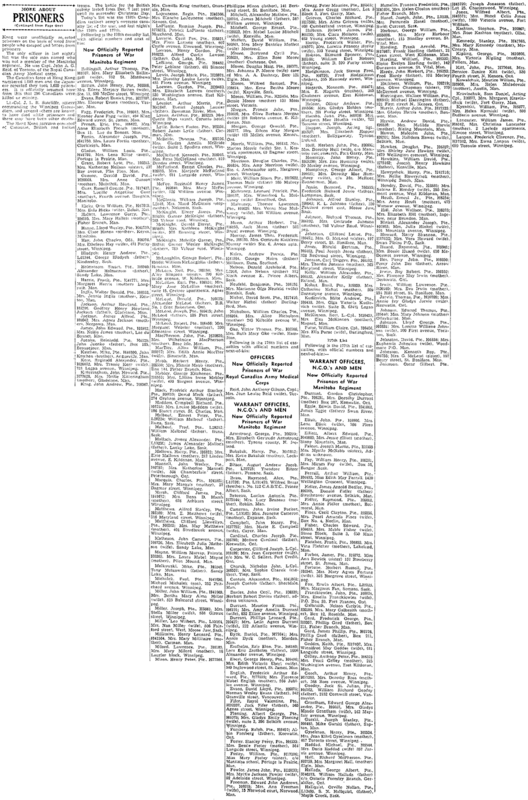 English, William Fostey, Nelson C. Galbraith, Sydney Hiscox, Gordon Hollingsworth, Arthur H. Jackson, Oscar G. Jonasson, arthur M. Lousier, Bert McKinnon, Arthur S. Mack, Francis D.F. Martyn, Frank Neufeld, Raymond W. Pellor, Kenneth E. Porter, William H. Savage, Reginald A. Smith. William J. Smith, Marcel Van Damme and Thomas D. Weir, all of Winnipeg; George H. Townsend (deceased) of West Selkirk; Ralph C. Rees (deceased), McAuley; Carl J. Bross (deceased), St. Boniface. Ernest J. Paul (deceased), Carman; Joseph H.P. Bazinet (deceased), Deerhorne; George D. Delorme (deceased), Carman; Hartley M. Winram, Neelin; Bronik Lewicki, Falconer; Gordon Clark, Carman; William Achtymuchuk, Malonton; Lucien A. Brazeau, Roblin; Arlis Clark, Carman; Edward William Cole, Swan River; Alexander A. DeVlleger, Mariapolis; Alexander Favel, Pine Falls; Stanley Kennedy, McCreary; William James Lancaster, Tyndall; Henry G. Lawson, Oakdale; Wilburt H. Lynch, Neston Siding; George Merritt, Birch River; George E. Mitchell, Kenville; John Olason, Somerset; Richard P. Oomen, Bird’s Hill; Aime Paul, Haywood; Joseph Podosky, Portage la Prairie; Lloyd T. Poole, McCreary; John W. Pople, Cartwright and Percy A. Thompson, Union Point. Death and disabilities were numerous at both Tanagawa and Oeyama prisoner-of-war camps where Hazama, a lieutenant in the Japanese army, was chief officer. Chief causes were working the sick and physically unfit men and neglecting to provide food, medicine, hygiene and other necessities, acceding to the charges laid. Nelson retired from his position at Canada Post in 1971. Helen, his wife, died in 1988 after a short battle with cancer. Nelson died suddenly sometime in late Sep, 1994, at his home in Buffalo Point. While Nelson lived to the ripe old age of 80 I can only imagine what sort of influence his time as a prisoner of war did to shorten his life.